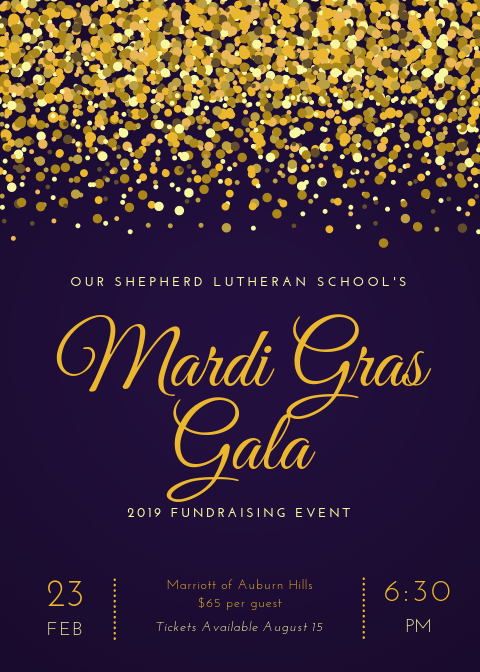 If you would like to make a donation to Our Shepherd Lutheran School through PayPal, please select the "Donate" link below. You can specify what you would like your donation to be used for. Our school can earn up to $60,000 each year! Clip the labels that say box tops for education and send them to your child's classroom. To volunteer (and earn time & talent hours!) please submit this volunteer form to the office. Thank you. Preparations are under way and we are so excited for our Mardi Gras Gala! For the month of October, tickets purchased for the Gala will be put in a drawing for a free hotel room either for the night of the event or any day in 2019. You may purchase tickets anytime in the school office during the school day. Soon, there will be an online paypal option. Purchase tickets by October 26 to be entered into the drawing for a FREE Hotel Room to be used in 2019.